Project Project: Norway 2011: What in the? Yesterday was the one month mark of out trip to Norway, so we are now officially on the downward slope! As we get progressively deeply entrenched in travel preparations, this also marks the temporary conversion of Project Project from random, spasmodic project-blog to European travel blog. So, if international travel with small children doesn't interest you, I suggest you look away until, oh... the middle of June. I thought I'd start out my new career as a travel blogger by telling you a little bit about the background for this trip. "Norway?" I hear you say, "Why Norway? What in the Sam Hill?" Well, friends, as it turns out, I am in fact Norwegian. I grew up there. I have a Norwegian passport and a Norwegian fondness for fish and skepticism of new ideas. And most importantly, I have a little Norwegian family that I don't get to spend nearly enough time with. 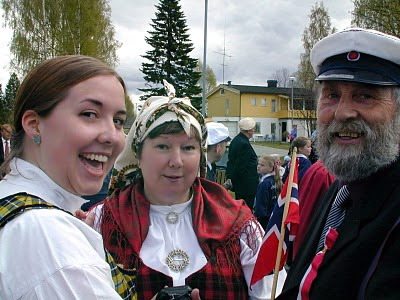 Me and my parents celebrating Norway's Constitution Day way back when in 2003. We've lived in different countries for 11 years now, but I will never stop feeling like their little girl, and Norway will never stop feeling like home to me. That, paired with the presence of one grandchild that needs to see his grandparents, and, unfortunately, the ever-present C-word* makes for some pretty compelling reasons to go. While it might not necessarily be practical, making the trip to Norway just feels like something we need to do. And so off we go! I'm sure that a lot of you have questions about this trip, and I will attempt to answer some of them in upcoming posts. If there's something you're just dying to know, please ask, and I will do my very best to answer. *Please note that this is an older post, and that my little Dad is out of the hospital and doing much better now than he was then. Not cured, but comfortable.